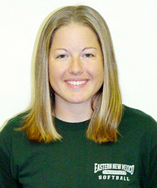 PORTALES, N.M. — Eastern New Mexico University softball player Tracy Jordan (Sr., 2B, Rosamond, CA/Desert HS) has been named First Team ESPN The Magazine Academic All-America for the 2006 season. The Academic All-America College Division Softball Team, which featured 11 players on the First Team and 12 players on the Second Team, was chosen by members of the College Sports Information Directors of America (CoSIDA). Jordan recently graduated from Eastern with a Bachelor of Science degree in Community Physical Education. She achieved a 4.00 cumulative grade point average. Earlier this spring, Jordan was chosen to the First Team of the ESPN The Magazine Academic All-District VI College Division Softball Team. It marked the third consecutive season that she earned First Team Academic All-District recognition. She spent all four years of her college career at ENMU. She recorded a career-high .394 batting average in 2006, while scoring 41 runs, earning 43 RBIs and providing 15 doubles. She also provided the Zias with a .618 slugging percentage. She started at second base in all 54 games in 2006. As a leader on the Eastern defense, she achieved a .959 fielding percentage with 102 putouts, 109 assists and nine errors. Her fielding percentage set a career-high, just edging out her .957 fielding percentage in 2004. Jordan tied for second on Eastern’s career list with 200 games played and tied for fourth with 193 starts. She also earned a .313 career batting average, ninth all-time at ENMU, plus 102 RBIs (4th), 38 doubles (3rd), 21 sacrifice bunts (tied for 1st), 77 runs and 36 walks. On defense, she earned 388 putouts, plus an ENMU record 365 assists. Her career totals included a solid .947 fielding percentage. She was chosen Second Team All-Lone Star Conference South Division this season and was an Honorable Mention All-LSC South selection in 2004. She was named to the LSC South All-Academic Team in 2004 and 2005. She has been nominated for the LSC South All- Academic Team again this year. ENMU concluded the 2006 season with a 33-21 overall record and a 13-11 mark in the LSC South (5th place). The Zias finished one game out of the third and final South Division berth into the LSC Tournament. ENMU led the entire LSC with a .360 team batting average, as the Zias broke the previous Eastern record of .328, set in 2005. CoSIDA District VI includes colleges and universities in New Mexico, Arkansas, Louisiana, Mississippi, Oklahoma and Texas. Players nominated in the CoSIDA Academic All-America program were starters or key reserves with cumulative GPAs of 3.2 or higher (4.0 scale). Each player was at her current college or university for at least one academic year. The College Division includes players in NCAA Division II, NCAA Division III and the NAIA. The Zias compete in NCAA Division II and in the Lone Star Conference South Division.